All of the ethnic patterns come assorted and may differ from the picture. Although each skirt is multicolor, you may choose the MAIN color of the skirt but you may not choose the exact pattern. Hippie clothes. Bohemian clothing. Artsy clothing for expressive women! Retro Miss presenting classic gypsy hippie chick bohemian shabby chic styles for creative women. Handmade boutique styles at affordable prices. 100% Cotton hippie hand-dyed and printed wrap skirt. 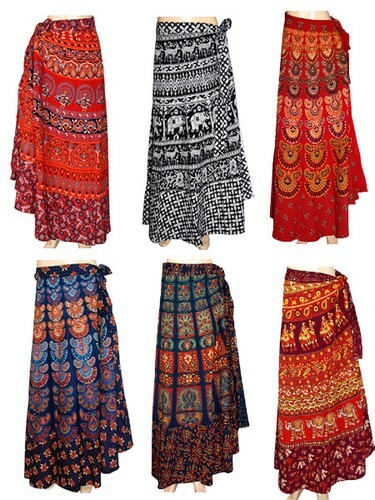 Traditional Indian shape and design, these are the same skirts you remember from the 70's. Authentic Indian skirt using old world Indian dyes. Wrap styling will fit sizes S M L XL comfortably. All of the ethnic patterns come assorted and may differ from the picture. Although each skirt is multicolor, you may choose the MAIN color of the skirt but you may not choose the exact pattern as patterns are all different and change from year to year depending on availability. Check the measurements below.